Gripers take note: Apple has updated and improved the MobileMe experience for iPhone and iPod touch users. If you go to the site via Safari, you’ll now find links to help set up Mail, Contacts, and Calendars. You will also be able to use Find My iPhone from another iPhone in case your handheld goes missing. The new page attempts to address some of this difference, but only goes so far. The settings link really only provides instructions on how to set up Mail, Contacts, and Calendars. 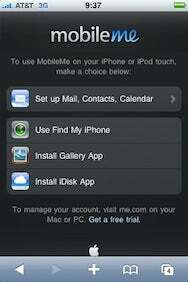 There are also links to install the iDisk app and the Gallery app for MobileMe. These two apps have proven pretty effective for accessing two of MobileMe’s most valuable features. Perhaps the most welcome addition is the Find My iPhone tool. Previously, locating your lost phone on someone else’s device required a workaround. Now, you’ll find a direct link to the handy feature so you can log in to your account from any iPhone, locate your lost device, display a message, make the device beep, or remotely wipe it. In the end, the new landing page doesn’t really include all that much. The native iPhone apps give you access to most of MobileMe’s functionality, and the Safari page merely reminds you of that fact. And if you want to adjust your MobileMe account settings, you’ll still need to do that from a computer. It’s not an integrated solution, but it’s a step in the right direction. To use it, of course, you’ll need a $99 MobileMe subscription.